More...different mount...the third. 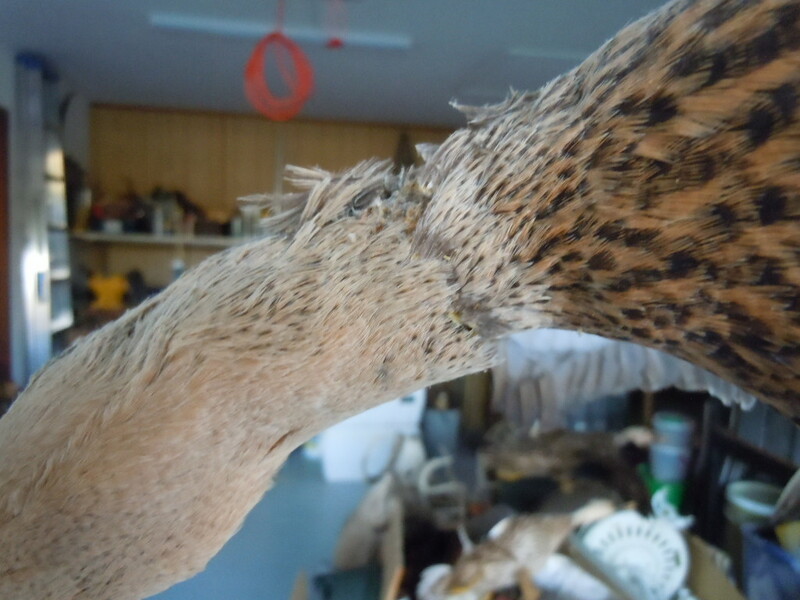 The neck feathers are so loose, that a simple breath across the neck will send them flying. This mount is "hosed", as are the previous two. Wow, definitely time to trash those I'd say. I'm not a taxidermist and so am not real knowledgeable of how it's all done but I'd say the guy who mounted those didn't do it right. With the thin skin a bird has and the feathers I'd imagine it takes a different process than critters with thicker skin and fur or hair but again that's just a guess. None of those mounts in the Museum look like that even tho they are older than me. With out being there and looking close it looks like bugs ate the feather roots off! IMHO if a bird is not fleshed properly there is some meat left on the feather tracks and the quill ends. This,as you may know,is what bugs eat. It is a touchy thing to flesh a bird with out putting holes in the hide. It is time consuming also and a lot of taxidermist are in a hurry to make a buck so there are short cuts taken ? I think you are all on to it there. Bugs! I am no taxidermist. Just the purchaser of services. Now that I know from these loss experiences, I won't be buying any more of their services. I cannot display these ducks. They're history. Sad really. I have enjoyed them. I've still got the very first mallard drake I ever harvested. it was Dec 1987. still looks pristine. the mount was done by and old gentleman (Mr Chritsenberry) long since gone who was stone cold deaf. about every 6 months or so, I have taken a very soft cloth w/ a lite spray of pledge and lightly wiped it down. I know of several folks that have other type mounts (deer, raccoon, bobcat) that were done by Mr christenberry a lot earlier than mine that still look great. 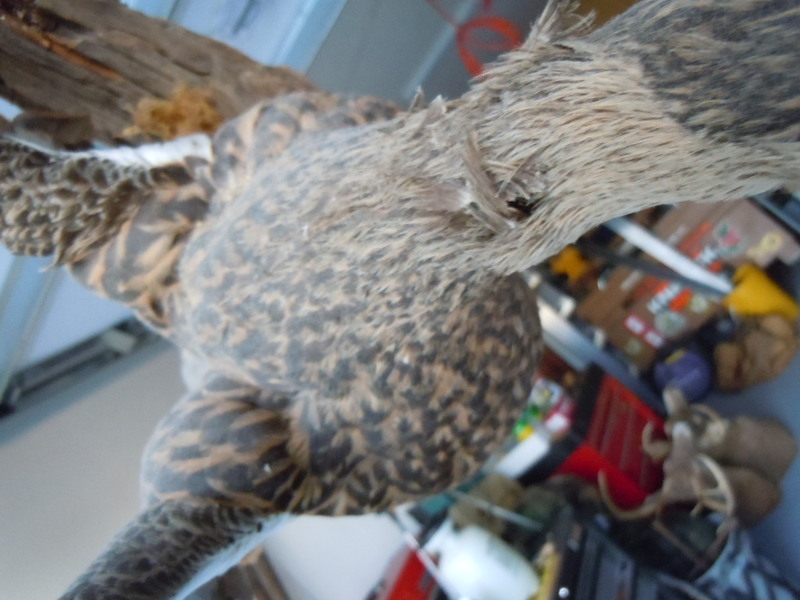 don't be afraid to ask a taxidermist his history. find a local well established sporting goods, older the better, and ask for their input. look closely at their mounts. it is possible you have carpet beetles . had the same problem a few months ago . everyone has them in their houses , they can overpopulate and cause a problem. need to have an exterminator look . 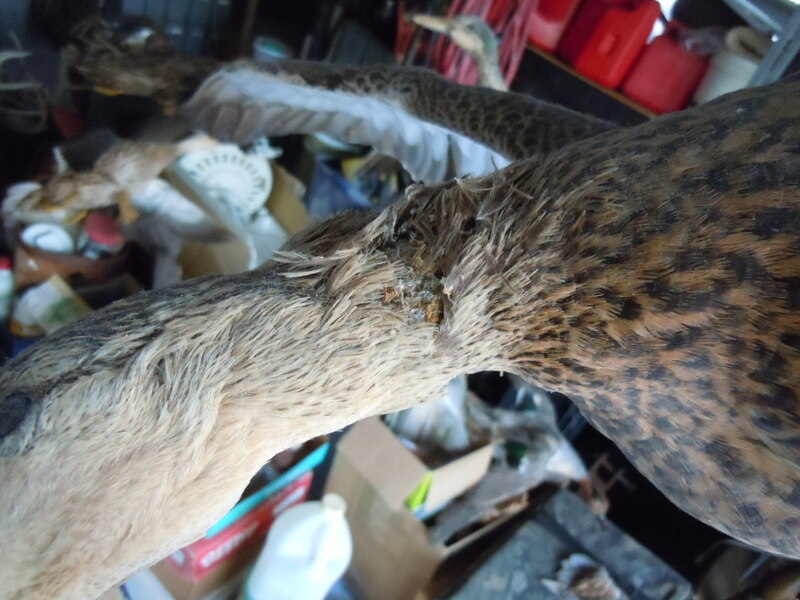 Last night, the one true mallard I have ever taken was struck by an object tossed to the 2nd floor that just did not quite make it, falling back down to strike the neck of the stuffed bird. The feather all came off like they were thistle on a dandelion in a stiff breeze. Another one bites the dust.